The new 2009 Unitrade Specialized Catalogue of Canadian Stamps is freshly off the press and ready to deliver. 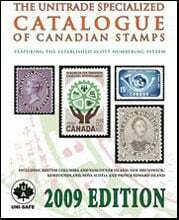 This is the ultimate reference for every Canadian stamp collector. It is printed in full color and spiral bound. Most varieties and errors are listed. It also includes FDC, blocks and postal stationery. All stamps are still numbered according to the established Scott numbering System. The foot note stipulates that some Winnipeg Tagged Stamps exist that are wider (42mm) or narrower (38mm) than the normal (40mm) due to a perforation shift between the 4th and the 5th columns (right side) of some panes. I have a block of 18 regular stamps (not tagged W2B) also from the right pane of sheet which has exactly the same width than the tagged stamps referred to in the Catalogue. Difference in width also exists on the left side of the W2B pane sheet, but I only have a PB not a block of 6 to compare. This perf shift variety, perfectly centered, is different from a typical perf shift with perforations in the midle of the stamp. Therefore, why are they not valued in the Catalogue? Those stamps can be compared to color variety (e.g. 106, 106b, 106c, 106i), repellex (e.g. 607ii), double printing (e.g. 540i), varieties (e.g. 610i, 610ii, 610iii, 610iv) or chnage in perf (e.g. 1764b) which are all valued in the Catalogue? This is a nice suggestion, I will transfer your suggestion to the editors. In the meanwhile for tagging errors you can consult the Canadian Tagged Errors catalogue by Rose. This catalogue is sold for about $10.95.